This is a talk introducing Women Welcome Women World Wide (5W). If travelling solo or on some occasions friends will take 2 people. You are able to meet a local who will advise you were to visit and if they have time, will take you around. Certain friends are not just Day Hostesses, the rule being if convenient you can stay 3 days. I will cover travelling in Australia & New Zealand also Europe Copenhagen. I make all the arrangements myself that can be done with careful planning. 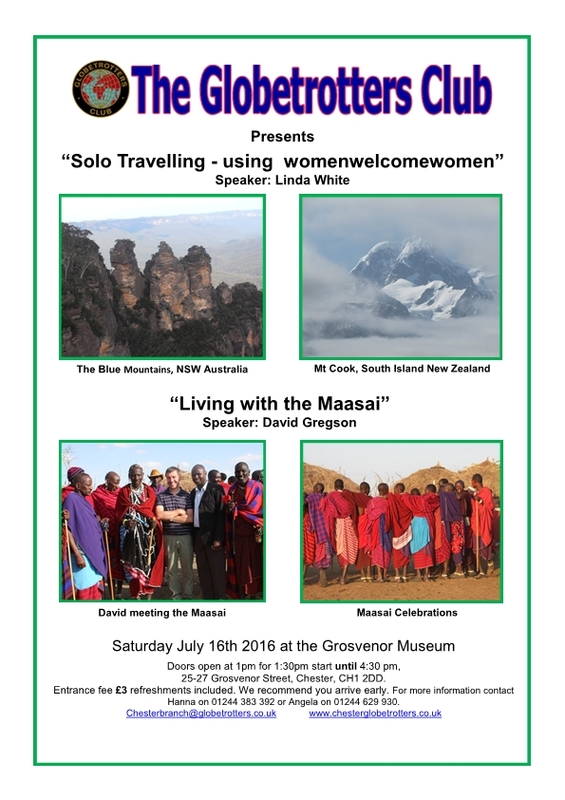 David Gregson – Living with the Masai Retired secondary school Assistant headteacher. In 2009 I went on safari to Tanzania. Whilst on holiday we came into contact with the Noonkodin Secondary school. This is a rural Maasai school located in a remote part of Tanzania. Over the years I have visited the school on numerous occasions and shared the difficulties of life of the Maasai. Nothing is ever what it may first appear to be. I’d be happy to share these experiences with the Globetrotters audience.